This female led bunch are based across various northern towns, including Halifax, Leeds and Manchester, and create loveable indie....with occasional dalliances into shoegaze. 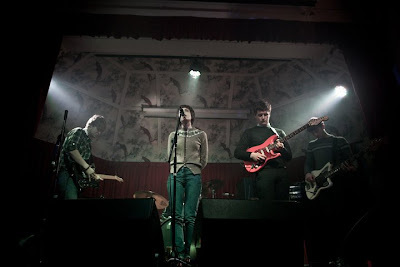 Tipped by NME as one of their breakthrough acts, and having recorded a BBC session already, their song 'Thieving Magpie' (from the EP of the same name, now on iTunes) is a whirl of indie pop choruses with hooks left, right and centre to drag you in. Also on that EP is 'Friend Of Mine' which displays singer Zandra’s vocal talents to a fuller extent, as she almost drones melodically over pacing electric rhythms, perhaps sounding like Two Door Cinema Club if they had a female singer. It's an acoustic version of 'Get Set Go' that really highlights the songwriting talents of the band. The acoustic guitars allow Zandra’s voice to be really heard, rather than competing with the usual swish of guitars, and the slower pace suits her voice to a tee. Compared to their faster songs this change in pace really highlights the lyrical skill, and its easy to see how big The ABC Club could be. Download a different version of 'Get Set Go' for free here.